First issued in 1977 as Shandar Records LP 83518, this recording features organ, recorder, harmonica, electric guitar, bells, voice, thumb organ (whatever that is) and maracas. “Recorded using consecutive overdubbing” indicate the liner notes. This technique sounds like a live tape delay system similar to the one Terry Riley used. In fact, the very rare Shandar label was at one time, also home to Terry Riley and La Monte Young. There also seems to be a lot of reverb, creating a slap-back-sort-of-echo, wet cave like environment. Ragnar Grippe, a student of composer Luc Ferrari at the time, composed, performed and recorded Sand in Paris, France. Inspired by the sand paintings of Viswanadhan and I guess the person on the cover is Viswanadhan. Viewed from above, the image on the cover shows a person leaning into a very large red disk with his/her arm out stretched. The green hub in the middle looks suspiciously like the hub inside my disc man. Sections of the music ebb and flow with repetitions of the delay system like sand. Quite rhythmic with all the echo, there are moments where the harmonica reminds one of a Thai khene (mouth organ). Maybe I’m really hearing a thumb organ? With all the current interest in minimal ambient electro-acoustic music, the obscure re-issues keep coming. Too cool. Historically, there’s a tradition of western composers not only studying the music of Indonesia but visiting Bali or Java and keeping the influence in their works. In the late 1920’s a Canadian living in New York, Colin McPhee, was exposed to the gamelan (a tuned percussion ensemble) music of Bali by a gramophone recording. The music became a passion for McPhee, he spent five years in Bali in the 1930’s and the music became a powerful force in his music. In modern times minimalist Steve Reich studied gamelan in the early ’70s and King Crimson guitarist/original member Robert Fripp showed an obvious gamelan/minimalist influence on the 1981 album Discipline. While Fripp and Reich probably didn’t go there, they obviously heard recordings. The two cd’s reviewed here are also by western composers who have traveled east and brought the gamelan vibration home to live on in their music in the west. The influence of Bill Alves studies show up in the cyclic patterns in his compositions. In Redundant I, highly manipulated samples of soprano Eve Vazana’s voice rotate past the listener and return. Bending Space has a highly ritualistic meditative quality a beautiful timeless moment. The composition The Terrain of Possibilities uses just intonation tuned samples of various Indonesian metal instruments, Korean chimes, piano, various percussion instruments and voice for a rhythmically driving work full of drama. Other musical influences are present too. Spectral Motion was inspired by the polyrhythms of West African drumming ensembles while the techniques of English change ringing informed Redundant I,. Time Auscultations as well as the other remaining tacks on the album move forward with the drive of gamelan while displaying Alves command of timbre: with the exception of The Question Mark’s Black Ink where Vicki Ray, piano and Mark Nicolay, percussion perform with tape, all of the works on the album were realized on the Synclavier II computer music system. The samples seem to be optimized for the tunings. Very much an electronic music album as well as being influenced by gamelan: a beautifully fascinating CD. Patrick Grant’s time in the east manifests itself in an amazingly relentless clock-like drive. Unlike the Alves cd, the Grant album is entirely acoustic. On the first track Fields Amaze Grant’s piano, percussion and gamelan is assisted by Barbara Benary on gamelan and David Simmon’s percussion. This composition – a well as the rest of the cd – rocks – in the sense that the dynamics are relatively flat and the timing is solid. A Visible Track of Turbulence seems to draw on early 20th century Euro-American chamber music with it’s instrumentation of flute, clarinet and piano – and of course stylistically too. Relative Segments for flute, clarinet, viola, cello, piano and keyboards reinforces the impression that Steve Reich and Phillip Glass also seem to be an influence. In Everything Distinct; Everything The Same piano, percussion and gamelan show an obvious debt to the Indonesian metal instrument ensemble. This cd is also stunning. quasi-bariolage effects. Thanks for asking. Bruford Levin Upper Extremities. Knitting Factory, April 18, 1998. It’s the return of the acoustic Bill Bruford! Take away all those electronic toys and it’s 1973 all over again with a new improved twist. While Robert Fripp is off touring with his King Crimson/Project Two band, BLUE (Bruford Levin Upper Extremities) is tearing up the northeast United States coast after a Japanese tour. At the Knitting Factory last night, an excited crowd packed a mostly standing room venue – i.e. little or no seats to start with. Master percussionist Bruford (King Crimson, Earthworks, founding member of Yes) started the evenings proceedings with a drum solo shortly to be joined by co-leader Tony Levin on bass and stick. While the polyrhythmic Bruford performed his amazing drum styling updated for this tour, Levin skronked a couple of notes on an electric upright bass by sawing close to the bridge and bouncing the bow on the strings. Post-Hendrix texturalist David Torn trotted on stage to add his guitar soon to be followed by trumpet player Chris Botti. While the are similarities – Bruford, Levin & Torn recorded with trumpet player Mark Isham on 1987’s Cloud About Mercury (ECM) – this band sometimes sounds more like King Crimson. On Fin de Siecle, the band started with a chromatic unison riff that lead to a classic Crimson twister. A middle section recalled both Cloud About Mercury and Crimson’s 1974 classic Red: a trumpet and bass melody (Cloud About Mercury) with a repeating guitar part that was very Fripp (Red). Unlike the cd, most of the compositions at this concert were stretched out and improvised upon. Cracking the Midnight’s Glass gave way to a bass riff reminiscent of Led Zepplelin’s Kashmir while Torn (solo, David Sylvian) abused his guitar – here’s a guitarist who’s not afraid to snap out those upper harmonics with a lot of distortion! Unfortunately, even when he showed off his stream-of-notes Holdsworth legato, the over abundant reverb from the board made his sound muddy. Torn spent as much time playing his guitar as generating undulating sheets of sound from his digital signal processing equipment. During the encore, he waved a tape recorder playing what sounded like a mid-eastern singer next to his guitar pickups and caught the sound in a digital loop, bringing it back many times for effect. Shades of Miles: I always thought that Cloud About Mercury was the ultimate direction for Miles Davis – the album he never made. Chris Botti (Paul Simon, Blue Nile) suggested Miles but Botti’s trumpet also had too much reverb, but in a way, this was perfect for the ethereal melodies he was spinning. An exceptional horn player perfect for this band. Co-leader Levin (King Crimson, Peter Gabriel) held down the music with his distinctive bass. Always solid and never a parody of his past, it is refreshing to hear an artist grow. With this concert, Bruford and Levin show that there is life outside of King Crimson by research independent research. While at the top of his form, Bruford in particular hasn’t shown any growth since 1989’s Anderson Bruford Wakeman Howe. Let’s hope there is more to the band Bruford Levin. Maybe more albums and tours with other soloist’s – might I suggest Bill Frisell and/or Pat Metheny? 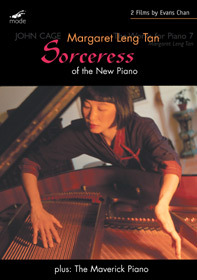 Sorceress of the New Piano (2004), 90 min., is a fascinating documentary by Evans Chan about new music specialist Margaret Leng Tan. Margaret is well known for her toy piano performances of music by John Cage and others, but also for pieces that use extended techniques such as prepared, plucked, bowed and/or strumming the piano. I always find it fascinating to see what all those mysterious and strange sounds are and how they are made. Not just an overview of Tan’s impressive work with the music of modern composers Cage, Henry Cowell, George Crumb, Jed Distler, Ge Gan-ru, Philip Glass, Guy Klucevsek, Stephen Montague, Somei Satoh, Tan Dun, Toby Twining, Lois V Vierk and others, but also a great introduction to modern “new” classical music. Cameo guest commentaries by various composers, critics and performers. Bonus film The Maverick Piano (2006), 50 min., features six full length performances of pieces by Cage (In a Landscape with Great Small Works, In the Name of the Holocaust, Music for Piano No. 2), Gan-Ru (Gu Yue “Pipa”), Erik Satie (Gymnopédie No. 3 with Great Small Works) and Toby Twining (Satie Blues with Great Small Works). I know there’s a lot of music documentary and live performance DVDs on the market, but there should be more like this one. DVD review by David Beardsley. Originally reviewed for the Downtown Music Gallery newsletter, November 2008. Any performance by Ornette Coleman should not be missed. He rarely performs his music his music in public and one never knows when he’ll blow through town. This has been temporarily corrected by a series of concerts, part of the Lincoln Center Festival 97. As an opening act, Aaron Copeland’s Fanfare for the Common Man was performed. Why? You’ve got me because I think Ornette’s a genius. We were then treated to selected American Poetry readings by actor Reggie Montgomery. Works included Martha Graham, N. Scott Momaday, Jonathan Edwards, Walt Whitman, Langston Hughes, Joy Harjo and Allen Ginsberg. After the New York Philharmonic assembled on stage, conductor Kurt Masur and genius Ornette Coleman entered stage left. Ornette the fashion statement, this time wearing a harmolodic black and white checker suit with matching harmolodic two tone shoes. For this alone (well, maybe not…), the crowd gave him a lengthy standing ovation. Amazing. Skies of America alternates the orchestra with the Prime Time Band. Some times, at the end of a Prime Time section, the orchestra plays a unrelated theme behind the band. The audience also applauded after every Ornette solo with Prime Time as if at a sporting event, violating sacred concert hall behavior: wait until the end of the work, do not applaud in between movements. Avery Fisher Hall was designed for acoustic music and the muddy sound system couldn’t really handle the sound of the Prime Time band. When the whole band played, individual members contributions (except Ornette) were lost in the mud. Toward the end there was a section were the orchestra played drones and each member of the band played solos or duets with Ornette. One could hear how brilliant Badal Roy’s tabla, or each of the bassist’s were. Or even how cheesy the keyboardist’s patches were. Keeping that DX7 bell piano sound alive in a newer model. Yeech! Nit picking aside, it was great to hear Coleman’s horn with the orchestra. Besides reinventing jazz, he has a distinct tone and phrasing to his alto playing. While I love the 25 year old Columbia version, let’s hope that he releases a current version of this piece. Presumably, this was recorded for the Caravan of Dreams label but never released. I’ve been waiting years for this concert, I’ve really felt bad about all the times I had to miss opportunities to hear Ornette perform acoustic music. The first half of the concert featured Ornette Coleman (alto saxophone, trumpet and violin) with original quartet members Charlie Haden (bass) and Billy Higgins (drums). With the late Don Cherry on trumpet, they changed the post-bop, post-Charlie Parker world of jazz by taking a turn and improvising on the melody, not the chord changes. A lot of established jazz masters were hostile, others learned and incorporated the new language into their own music. This evenings concert featured music either new or unfamiliar to me, doesn’t really matter because the compositions were obviously Ornette. Not just the give and play between the members of the trio, but the solos by Haden (liquid) and Higgins (stunning). It was a long set!!! After intermission, the trio was joined by Kenny Barron (piano) and Wallace Roney (trumpet). Damm strange to hear Ornette with a piano, but I guess it worked. At one point, Barron had a solo spot and sounded way too manicured, as soon as Haden walked in, those nails grew. Roney, on the other hand seems to have a bit of that dusty old neo-classical-bop in him that he really tried to shake off. He would bend and slide a bit, but couldn’t resist playing some runs to blow off steam. Towards the end, the different approaches to tuning between Ornette and Ronney really showed, beating like crazy. Vocalists Lauren Kinhan and Chris Walker both sat in (stood in?) for a song a piece and also a duet. This gave Ornette an opportunity to harmolodicize to a ballad, sliding in his own melodies. Kinhan’s phrasing was particularly stunning. The band closed out the set with the blues Turnaround. How was the sound? I’m glad you asked….the first half of the evening was pretty good , the drums could have been a wee bit louder, the horn was a a bit piercing when loud, too soft when soft and the bass was just right, said Goldielocks. During the second half, Ornette could have been a bit louder. I sat about 15th row but up on the wall, in the 1st tier. Did I mention how much I miss Don Cherry and Ed Blackwell? Both reviews originally appeared on-line in Juxtaopsition Ezine. NY Times review of the same shows over here.